An awesome WordPress plugin that creates a top or bottom scroll progress bar to indicate the remaining reading time as you scroll down. Progress Bar Position. Mostly progress bars are displayed on the top of the website. However, with our new WordPress progress bar plugin, you can exhibit your progress bar either on the top or the bottom of your website. The option is there to let you choose the position where your website would flaunt out its beauty and would not disturb other elements on your website. Color Options and Opacity. There is an unlimited color palette to choose the background and foreground of your reading progress bar. Choose the ones that go along with your website and its look. Now, you don’t want your progress bar to look like the odd-one, do you? Also, after choosing the correct colors for your background and foreground, you can also select the opacity for both of the fields. Progress Bar Height. The Progress Bar height setting allows you to choose the thickness of your reading progress bar. Some might like it thin to make it more elegant. Whereas, some might prefer the progress bar a little thick to make it bold and eye-catching. Border Radius. If you want to give your progress bar a tiny adornment, you can make it curvy by tweaking the Border Radius. Template Condition. This is where you need to select the Template Condition for your progress bar as to where you want it to be displayed. You can choose the reading progress bar to be displayed on the front page, blog page, or posts and pages. You can also choose to display the reading bar only on posts or only on the pages of your website. Light Weight. Catch Scroll Progress Bar is a simple WordPress plugin to display an elegant reading bar that is extremely lightweight. It means you will not have to worry about your website getting slower because of the plugin. Responsive Design. Our new WordPress Progress Bar plugin comes with a responsive design, therefore, there is no need to strain about the plugin breaking your website. Compatible with all WordPress Themes. Gutenberg Compatibility is one of the major concerns nowadays for every plugin developer. 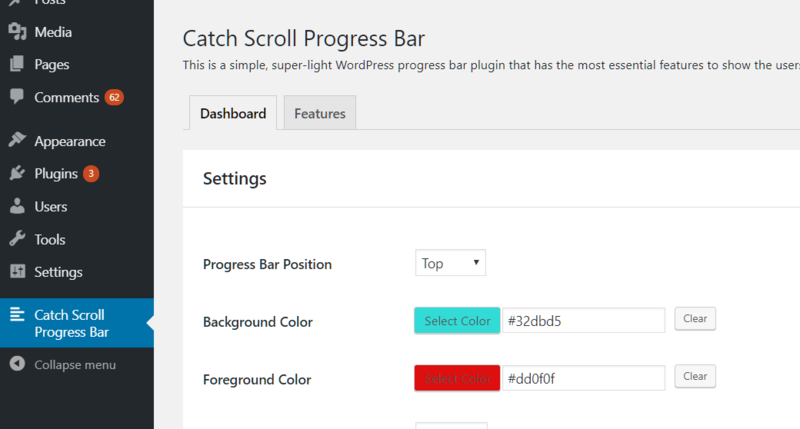 Our new Catch Scroll Progress Bar plugin has been crafted in a way that supports all the WordPress themes. The plugin functions smoothly on any WordPress theme. 1. Download and install the Catch Scroll Progress Bar plugin.